The new House speaker discussed school finance in an interview with Texas Tribune CEO Evan Smith in Lake Jackson. Since officially winning the gavel this month, new Texas House Speaker Dennis Bonnen has been adamant that boosting public school finance is a top priority this year — and that some of the new money schools receive should be tied to performance. But so far, the Angleton Republican has held off on offering specific plans. That continued Friday, when he suggested in an interview that he doesn't plan to weigh in on the details any time. Since the Texas Legislature convened earlier this month, Bonnen, along with fellow Republicans Gov. Greg Abbott and Lt. Gov. Dan Patrick, have aimed to show a united front and stay focused on meat-and-potato issues, such as school finance and property tax reform. The three have generally agreed that an increase in school funding should produce better results. Speaking on stage with Smith during an event in Lake Jackson, Bonnen did list one specific thing he didn't want: He said he doesn’t support using student test scores to determine school funding — a recommendation that the Texas Commission on Public School Finance has made to the Legislature. Beyond that, Bonnen largely maintained his stance that schools that receive more funding need to produce better results. Both chambers' proposed budgets include billions of more dollars for public schools; the lower chamber has proposed injecting $9 billion into public education and property tax reform, while the upper chamber wants $3.7 billion to give teachers pay raises and $2.3 billion to aid the state’s reliance on property taxes for school funding. So far, no legislation has been filed proposing outcomes-based funding. Referring to the Senate’s teacher pay proposal, which would give schools the money to provide a $5,000 pay raise to all full-time teachers, Bonnen said the House’s version of the legislation, which he described as a block grant, would aim to provide districts more flexibility with how they spend those funds. He told reporters in the House chamber earlier this week that the state would be better off giving local school districts that money to then decide how to "manage their own salaries and pay their teachers there." 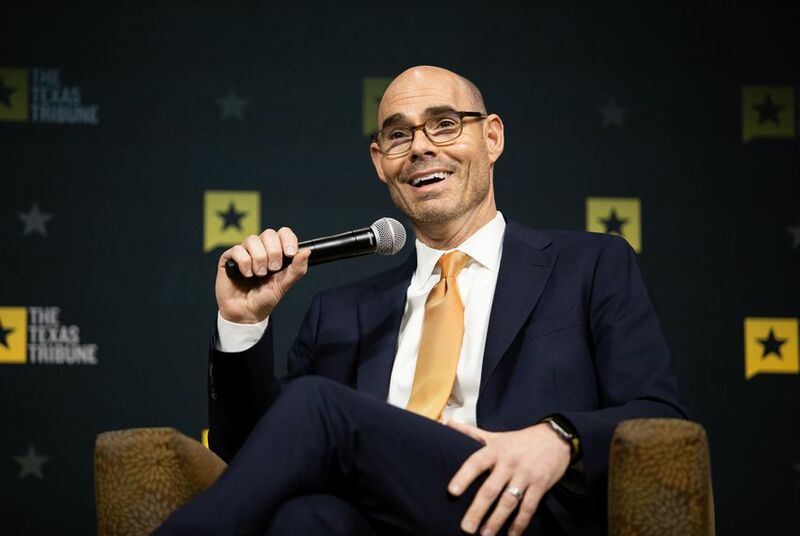 Bonnen also weighed in on a number of controversial proposals that have previously failed at the Capitol, including the “bathroom bill,” which would have regulated which restrooms transgender Texans can use, and private school choice. He said that there was not any appetite among House members to resurface either issue within the chamber this session. Bonnen’s remarks on Friday struck the conciliatory tone that he, along with Patrick and Abbott, have been trying to publicly set this session. The dynamic so far has been a vast departure from an intense 2017 regular and special session that centered on divisive issues and intraparty squabbles. Abbott, as part of that fallout, got involved in House primaries — and was unsuccessful in two of his three campaigns to unseat incumbents from his own party. Bonnen said he’s already advised Abbott against carrying out that strategy after this year’s session — and that he doesn’t think the governor “will do that in the future.” (In a recent interview with The Texas Tribune, Abbott did not rule out getting involved in future Republican primaries after this year’s session).